A German Christmas Bread, pronounced shtawl-len, is shaped as a folded oval like a giant Parker House Roll. 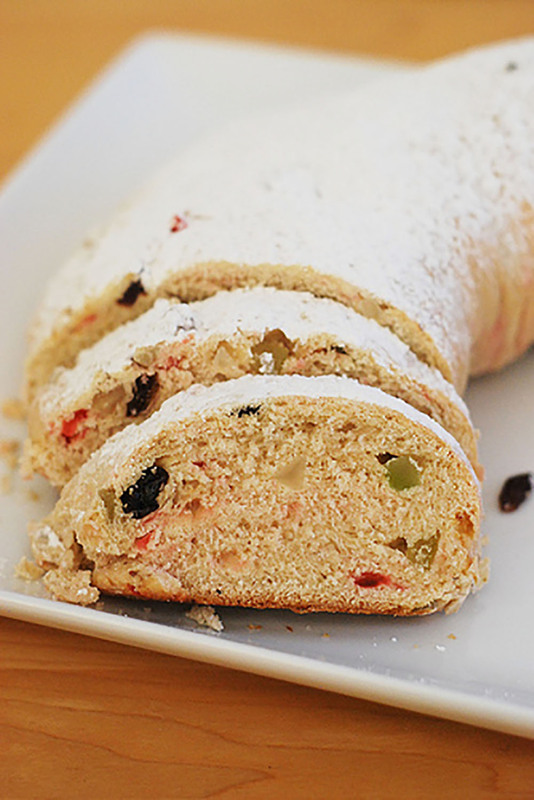 Traditionally, it is full of candied fruit and nuts for the holidays. Place room temperature ingredients in pan in the order listed. Candied cherries, citron, raisins and walnuts can be added 5 minutes before the end of the last kneading. Select Dough/Manual cycle. Check dough consistency after 5 minutes of kneading. The dough should be in a soft, tacky ball. If it is dry and stiff, add water, ½ to 1 TBSP at a time. If it is too wet and sticky, add 1 TBSP of flour at a time. See our Bread Machine section for more helpful tips and information. At end of cycle, remove dough; follow Shaping and Baking instructions. Combine yeast, 1 cup flour, salt and sugar. Heat water and butter to 120º to 130ºF. Butter does not need to melt. Combine dry mixture with liquid ingredients in a mixing bowl on low speed. Beat 2 to 3 minutes on medium speed. Add eggs; beat 1 minute. By hand, add the dried fruit and nuts and stir in enough remaining flour to make a soft dough. Knead on floured surface 5 to 7 minutes or until smooth and elastic. Use additional flour if necessary. Place dough in lightly oiled bowl and turn to grease top. Cover; let rise until dough tests ripe. Combine dry mixture with liquid ingredients in mixing bowl with paddle or beaters. Mix for 4 minutes on medium speed. Add eggs and beat 1 minute. Add the dried fruit and nuts; gradually add remaining flour. Knead with dough hook(s) 5 to 7 minutes until smooth and elastic. Place dough in lightly oiled bowl and turn to grease top. Cover; let rise until dough tests ripe. Place dough in lightly oiled bowl and turn to grease top. Cover with plastic wrap or foil. Refrigerate 6 to 12 hours. The dough will need to be punched down in a couple of hours. Remove dough from refrigerator, punch down, and allow to rest 10 minutes before shaping. On a lightly floured surface, roll or pat to a 14 x 8-inch oval; spread with 1 TBSP softened butter. Fold in half lengthwise, place on greased baking sheet and curve into a crescent. Press folded edge firmly to partially seal. Cover; let rise until an indentation remains after lightly touching side of stollen. Bake at 350ºF for 25 to 30 minutes until golden brown. Cool on rack. Sift powdered sugar over top or drizzle with your favorite powdered sugar glaze and garnish with additional cherries and nuts, if desired.